Google is planning to produce more laptops and tablets along the lines of the Pixelbook and Pixel Slate soon enough, the company has confirmed, contrary to previous chatter on the grapevine which suggested that these products had been canned, at least for the time being. Recently we heard from anonymous sources who spoke to Business Insider and imparted the information that staff were being temporarily shifted away from the Google Create division, which is responsible for pushing out products like the Pixelbook and Pixel Slate, and therefore that any such hardware in development had likely been shelved. However, Google has now told The Verge that this hardware division does in fact have new notebooks and tablets in the pipeline. Should I buy a 2-in-1 laptop? What would those products be? Google wouldn’t elaborate, beyond acknowledging the existence of the hardware – which is hardly unusual, and indeed said devices may still be at a relatively early stage. This is backed up by a report from 9 to 5 Google, which notes that at Cloud Next 2019, Google ran a session on ‘Google Hardware for Business’, where it mentioned new devices on the way that did things differently to the Pixelbook and Pixel Slate, and would push forward on the working-on-the-move front. So it would seem Google is eyeing the business world with these devices, although of course, that doesn’t mean consumers won’t be able to buy and use them. 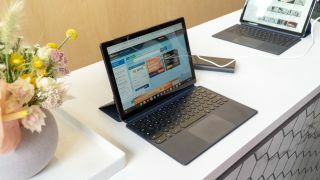 Google noted that through a business lens, the Pixelbook was aimed at business ‘leaders’ such as executives or IT workers, and that the Pixel Slate was targeted largely at sales reps and customer-facing staff. Apparently the new device, whatever it may end up being called, is aimed at those operating “constantly on the go that have a working paradigm where 60% of them – and this is all of our [Google] employees – are working outside of their desk” (including working remotely, of course). We can but guess at the exact nature of such a device, but it goes without saying that it will doubtless be highly portable, likely with a decent raft of security measures if it’s going to be a laptop/tablet used by employees when out and about. Some chatter has speculated that it might use Fuchsia – Google’s planned convergence of Android and Chrome OS, according to the rumor mill – but that doesn’t seem too likely given that Fuchsia is reportedly a long way down the line (maybe five years), and we expect this new Pixel hardware to emerge sooner than that, given the way Google is talking. Whatever happens, Google is likely to want to make a move away from what it did with the Pixel Slate, as the 2-in-1 device wasn't particularly well received, and we found it a rather perplexing piece of hardware in terms of how it was pitched and priced.